One tends to approach a Samuel Beckett play the sane way one would a wheatgrass smoothie or a quick dip in the English Channel, knowing that whilst not necessarily being enjoyable it is definitely something that should be undertaken. Certainly from the near full houses at the Duchess Theatre and the Young Vic it would seem that Beckett’s forbidding reputation is doing little to dissuade people from going to see his plays. Perhaps watching as most of Somerset disappears under water has done wonders for people’s sense of the absurd? 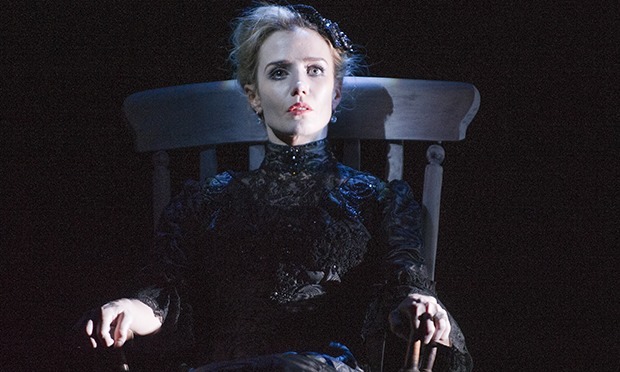 Whatever the reason, London is currently home to two major Beckett revivals; the Duchess Theatre, carving itself a niche in serious drama following their decision to host the hugely successful Chichester production of Arturo Ui, has transferred Not I from the Royal Court and paired it with two other late Beckett monologues, Footfalls and Rockaby. Not to be outdone the Young Vic has staged one of Beckett’s greatest works, Happy Days. Written in 1961 it came during a ten year stretch that also saw the production of Waiting for Godot, Endgame, Krapp’s Last Tape, as well as the novels, Malone Dies and The Unnameable. Comparatively young, at 63, compared to recent winners, the award of the Nobel Prize for Literature in 1969 must by then have been mere formality. Watching both productions in the space of three days it is impossible not to become immersed into Beckett’s singular vision and begin to understand themes that, viewed in isolation, can seem elusive. It is common to talk about how ‘nothing happens’ in his plays but viewing the four works in close succession it is possible to see what Beckett intends through this effect. In the trilogy at the Duchess Theatre, we see the increasing minimalism of his later work, which seeks to pare theatre back to its most fundamental elements: action, voice, reaction, and that probably reaches its apogee in Not I – a work that is part-theatre, part-performance art and part-tone poem and in which ‘nothing happens’ at a furious rate. In Not I, the actor has become the literal mouthpiece for Beckett’s vision, in Footfalls every pace is prescribed before the actor steps onto stage and in Rockaby the actor can only react to what is offstage, they do not even control the rocking of the chair. Put together as one piece we, the audience, are left with an overwhelming sense of the lack of agency in the actor which seems to parallel the three characters inability to exert any sort of control over their environment. It is telling that Beckett’s great collaborator, Billie Whitelaw, spoke of finding Rockaby ‘very frightening to do. And…desperately lonely to do’. In this work Beckett has recreated, without ever using the words, the universal and unyielding march of time, which must, inexorably, lead to death. The actor is alone and powerless and knowing all moments move towards the final moment when the chair will stop rocking and they won’t be called upon to join with the pre-recorded voice to plaintively cry ‘more’. With the meticulously written script prescribing each action of the actor there is very little for the actor to do and it is hard not to imagine, as the performance continues, an unseen struggle within the actor about mortality, a rising panic, and a desperation to share with the character the crying of ‘more’. It is this interior struggle, unseen and unheard, that makes the evening a disconcerting and tense experience for the audience; we are used to following characters that, despite being creations of their authors, give the impression of being able to determine their fate and it is rare to be presented with those who follow seemingly predestined paths without overtly challenging their situation. Dwan is superb in all three roles and to move from the ferocity of speed of Not I to the very deliberate pacing of Footfalls is an incredible achievement. The two parts are polar opposites with Footfalls metronomic style coming as a shock after being subjected to the torrential outpouring of verbal dexterity in Not I. It is a hallucinatory and somewhat nauseous experience. With even the fire exit signs switched off the darkness is total and isolating, and with it comes a realisation of just how rare it is to experience this total immersion in the dark. Throughout Dwan’s mouth hangs disembodied in the air and words pour out into nothingness, a void where the stage should be. By removing all barriers between the audience and Beckett’s words, we are being presented with text in its purest form; even purer than a book where the written word is still subject to the distractions from the external environment. The darkness and the speed of delivery means that in Not I not even our imagination is allowed to function. The result is troubling; despite best efforts the mind inevitable wanders, we cannot quite process what we see and hear – we begin to ask whether the mouth is moving, is it increasing in size, only to be pulled back to the matter in hand by the harsh, repeating ‘Who? Me? No! SHE’. Beckett understands that humans do not seem able to shut down our imagination entirely and that we have developed a natural inclination to create narratives even when they are not called for and Not I plays on this wonderfully. 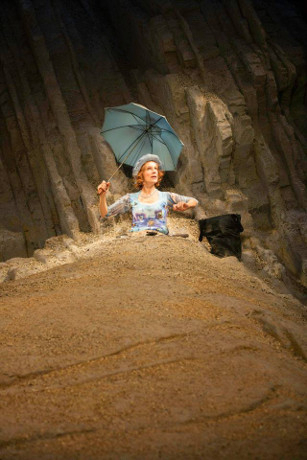 His fascination in the denial of a narrative is also apparent in Happy Days; he fashions an incredibly striking image of a woman buried up to her waist in sand, living in a permanent daylight and woken by an unseen claxon but, unlike most playwrights, he has no interest in explaining the causality behind why this should be. For Beckett it is enough for it to have happened and to then explore the situation as it exists. 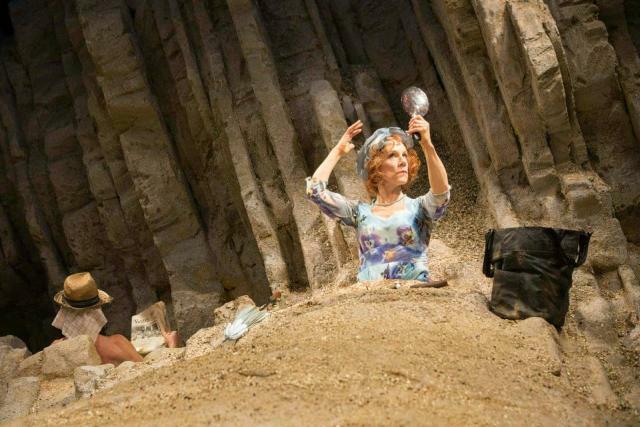 Winnie makes several references to day and night, checking herself and referring then to the ‘the old style’, whilst the ongoing passing of time within the play is marked by the gradual submersion of Winnie in the sand. This existence of time would suggest causal relationships, however for Winnie time passes but the action itself never changes, routine stops and starts, governed by the sound of the claxon. Despite this alien strangeness, there is an intense domesticity to Winnie’s world and it is suggests a mirroring of the suburban routine of a housewife stuck in a rut. Time passes, nothing changes but slowly one is buried until it is too late to change direction. Charles Spencer notes that Juliet Stevenson, playing Winnie, comes across as somebody one might find chivvying members of her local Women’s Institute and contrasts with previous performances, by Fiona Shaw and others, that were Irish-inflected portrayals and highlighted a certain ironic jauntiness. Stevenson brings to the role a forced happiness that can barely contain her sense of panic. As the claxon first sounds there is a hollow fear in Stevenson’s eyes that suggests the only option is to put a brave face on things and that returns when things seem set to disturb the order she has created to herself; such as the sense of frustration when things her handbag do not present themselves, the parasol flying out of reach or her relationship with Willie. The casting of Stevenson is wonderfully astute as it hints at a path connecting Ibsen to Beckett. Stevenson’s portrayal of Nora in A Doll’s House, filmed in 1992, has become one of the iconic portrayals of Nora and opened up the character’s emotional side, moving away from more traditional approaches that hid Nora behind a slightly icy presence. As a result it is hard not to see similarities between the barely hidden hysteria of Stevenson dancing the tarantella as Ibsen’s Nora and Beckett’s Winnie becomingly increasingly frustrated at not being able to decipher the writing on the toothbrush and needing her husband to provide an explanation. Both parts rely heavily on the relationship with a husband; Nora whilst able to move freely remains trapped by her dependency on her husband, and Beckett has gone further by physically trapping Winnie but also sharing Nora’s inner frustration. She appears to both love Willie whilst also being angered by her dependence on his continued existence and the fear she feels when he doesn’t respond. Beckett describes Winnie as having bird-like attributes and Stevenson marvellously draws this out in the first half, with wonderfully fluttery movements and a sense of gracefulness that often give her arms the appearance of wings. Again this parallels Torvald’s references to Nora as a bird in A Doll’s House; a songbird, a supposed playful term, which also reflects Nora’s trapped status. In Happy Days the bird is more clearly trapped physically and emotionally; yet, like Ibsen heroines, she retains one final sense of agency – she has a revolver and so has the means within her to escape but cannot seem to take the action – it is perhaps a faint echo of the ending of Ibsen’s Hedda Gabler. The revolver is a final masterful touch by Beckett and suggests that these naturalistic allusions have been set for the audience to find. Chekhov’s maxim states that ‘if you say in the first chapter that there is a rifle hanging on the wall, in the second or third chapter it absolutely must go off. If it’s not going to be fired, it shouldn’t be hanging there’ but the play leaves this statement unanswered; Willie’s advances towards the gun and/or Winnie, and the audience must remain in a Heisenbergian state of infinite possibilities as to whether or how it will be used. The world may have moved on from the formal rigorousness of the modernists yet both Happy Days and the Not I / Footfalls / Rockaby trilogy prove that the masters of the form have created work that withstand the test of time and continue to intellectually challenge audiences in a manner that seems increasingly rare in today’s theatre.